My Sweet Haven: Missing my hubby! Last night was the first time in two years of being married that we didn't go to bed together. Hubby had to work on a night shift this week and the set up felt weird. Thank God it's not permanent. I don't think I would ever get used to him working at night. I've worked in a graveyard shift for 2 years back in the Philippines and I couldn't get used to it. No matter how many hours of sleep I get during the day, I'd still feel weak and didn't have the energy to do anything fun at all. It was hard back then when I was still single, I'm sure it's tougher now that I'm married. Anyway, I just wanted to share some mushy notes from hubby. I was browsing through a stack of bills that we received yesterday when I found a green envelope with a message that says "Mahal Ko" on it. Of course, I was surprised, I never thought he'll have the time to get a card, let alone sit down and think of something sweet to write in a middle of a weird work schedule. But he did it anyway and it made me cry when I was reading it. He said it's supposed to make me smile, but for some reason, it struck me that I'm actually alone in the house and that I'm going to go to bed alone as well. Haay! It's okay, we're going to make it through. He called me 30 minutes before my usual bedtime and he tucked me in bed on the phone, lol! Charing jud kaau ni si bana oi! But I love it anyway! Atsus! Hayyy ka sweet na vanana..ka haba ba sa hair mo jen..Anyway, i'll grab your badge Jenn para additional sa mag collection ko. I'll add you also to my EC Blog Lists. Hope you'll do the same. Have a great day. That's a sweetie one Jenn! 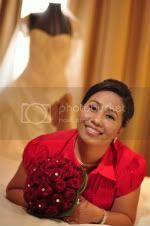 God bless of your marriage..
pagkatam issssssss naba aron paminawn. lanay pud tinggil itom ta aron ug akoy na asawa hehehe..
anyway, just got your messages on my blog and yes Casino Espanyol is really awesome venue for a wedding. Elegante kaayo ang Grand Ballroom kay high ceiling. Then, naa pa silay garden and pool, nice for photo taking. Too bad, waiting list ra ko. Ngita pasad ko lain nga arang2 ang venue. And Boracay would be a great place for honeymooners. I'm sure ma-enjoy gyud ka didto. Just leave a note on my blog kung ngayo ka tips.. hehehe..
Super jud ka-sweet c hubby nimo Jenn ai. When my hubby went to shoot landscape at least 1 week, it felt like years. Time runs so slow. We are just very lucky Jenn that we found the man that treated us more than what we expect for. Ingat there always. Aww that is so sweet- it is impossible to be jaded when I read such wonderful posts- thanks for sharing.